Mediterranean Grilled Turkey Burgers are an easy and delicious ground turkey recipe loved by the whole family. 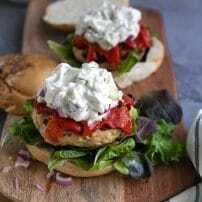 Topped with roasted red peppers, fresh greens, and a refreshing cucumber yogurt sauce, these Mediterranean Turkey Burgers are guaranteed to be an instant favorite. 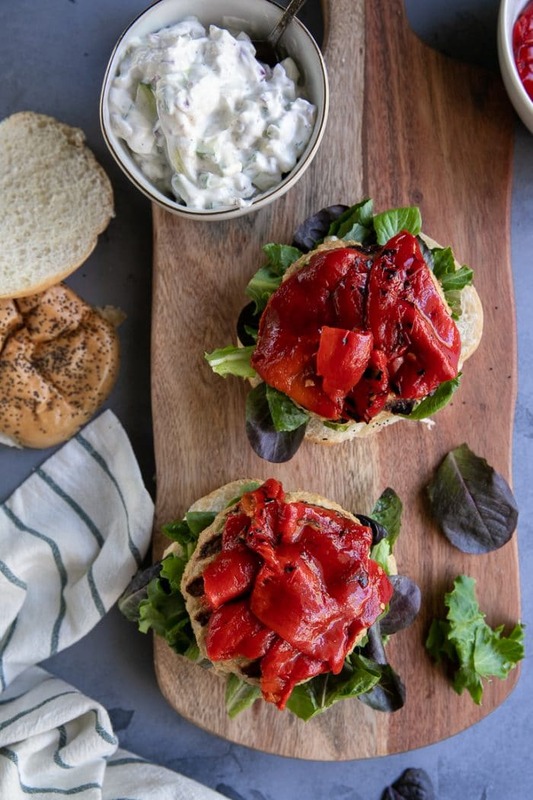 Few things in life taste better than oversized burgers like these Grilled Turkey Burgers. 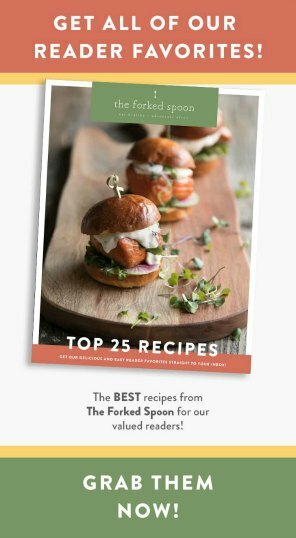 Other favorite burger recipes include these Grilled Salmon Burgers with Garlic Lemon Aioli, Vegetarian Beet Burgers with Avocado and Sweet Potato Fries, and Chipotle Pumpkin Veggie Burgers. Growing up I only ever ate burgers one way- with ground beef, processed American cheese, ketchup, and mayonnaise. They were fantastic. However, now that I’m a grown-up, I sometimes find myself craving more grown-up flavors. 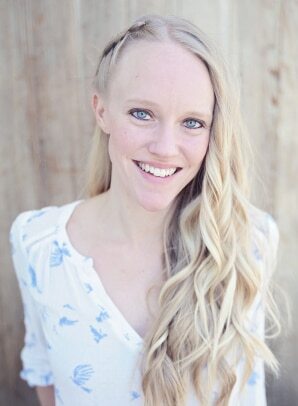 Fortunately, my definition of grown-up does not mean boring or stuffy or complicated. 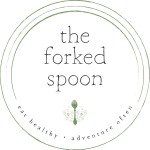 Anyway, if you’ve been to this here blog of mine more than once, you may already know that I typically ditch the ground beef for ground turkey. If you’re new (hi! ), don’t worry, I don’t always do this, however, in the case of these Mediterranean Turkey Burgers, ground turkey felt more appropriate given the lighter, fresher toppings that would be going on top. Don’t let the lack of crazy seasoning fool you, these grilled turkey burgers come packed with tons flavor thanks to the green onion and feta cheese. If you prefer a little more spice to your burgers, feel free to add a pinch of cayenne powder and cumin to the mix. Before preheating, brush clean grill grates with oil or spray with non-stick cooking spray. Preheat an outdoor grill to medium, or, if using an indoor electric grill, set to high. Transfer pre-formed turkey burger patties to the grill approximately 1-inch apart. Cook each side for approximately 6 minutes. Remove from the grill when turkey burgers register 165 degrees F. by an electric meat thermometer. ARE THESE MEDITERRANEAN TURKEY BURGERS HEALTHY? Usually, whenever someone says the word “burger” I immediately think- unhealthy. This makes sense given all those beefy, cheesy, mayo-ey burgers I grew up eating. Fortunately, not all burgers are created equal. So, depending on your own definition of “healthy”, I will allow you to determine if these Mediterranean turkey burgers pass the test. However, if you were to ask me, my answer would be “yes, definitely” these grilled turkey burgers are healthy. They’re made with ground turkey, not beef. Beef is higher in fat, especially if you make your burgers with the fat-free turkey option. Put the cheese in the patties. Adding a tangy cheese like feta to the ground meat mixture before forming into patties is a great way to still get that cheese flavor without all the cheese. 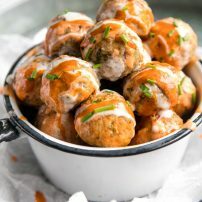 Add a yogurt sauce filled with veggies instead! There’s a lot of protein in these burgers. 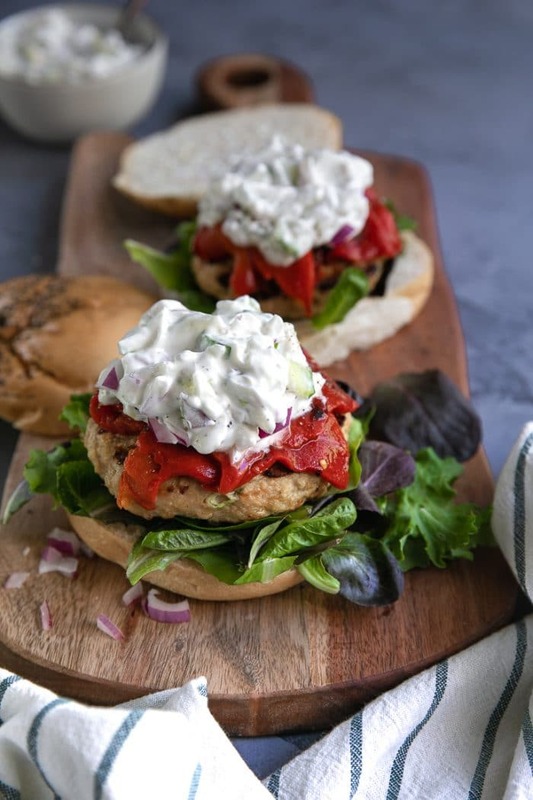 Between the ground turkey, feta cheese, and yogurt, these Mediterranean turkey burgers are packed! Now, do you have to make a yogurt topping? no. However, my logic behind the yogurt topping was that hopefully, fingers-crossed, it would help confine some of the veggies. After all, no matter how hard I close my eyes and wish that yogurt taste like mayonnaise, it does not and will not ever taste like mayo. As a result, a thin layer of Greek yogurt on the bun simply will not do. 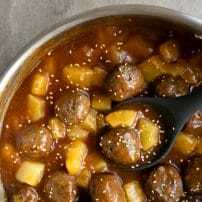 You will need a generous spoonful. It only made sense to add the cucumber and red onion in with the yogurt. Again, you don’t have to do it this way. But it worked. Yes, it was still messy, but I got it all in my mouth. Get yourself a digital meat thermometer. Otherwise, you will probably overcook your grilled turkey burgers which will make you wish you had some mayonnaise. Try not to over-flip. This applies to all burgers and all meat- they really don’t like it. Have fun with the toppings. No really. What you see here are simply suggestions. Avocado would also taste great. Or grilled eggplant! And what about some hummus? 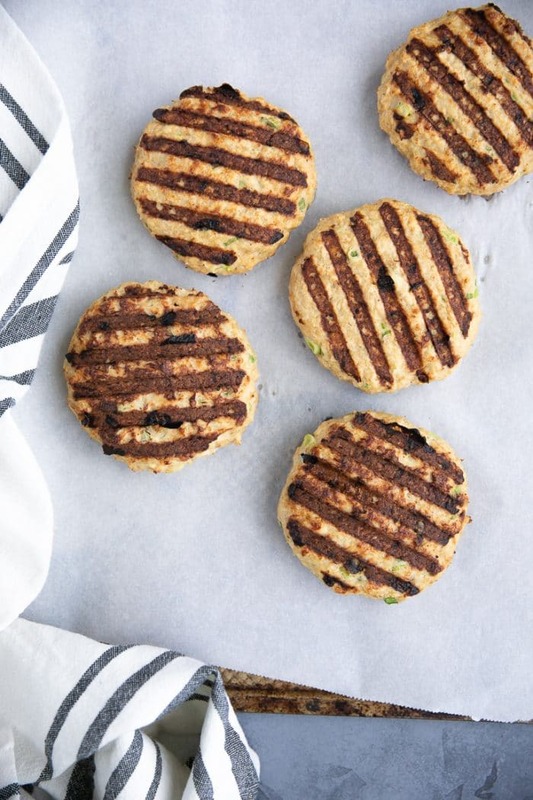 Make extra turkey burger patties and freeze them for later! Or, eat the leftovers as a salad! Ditch the carbs and wrap it up in some lettuce. Ok, guys, so tell me- what do you think? 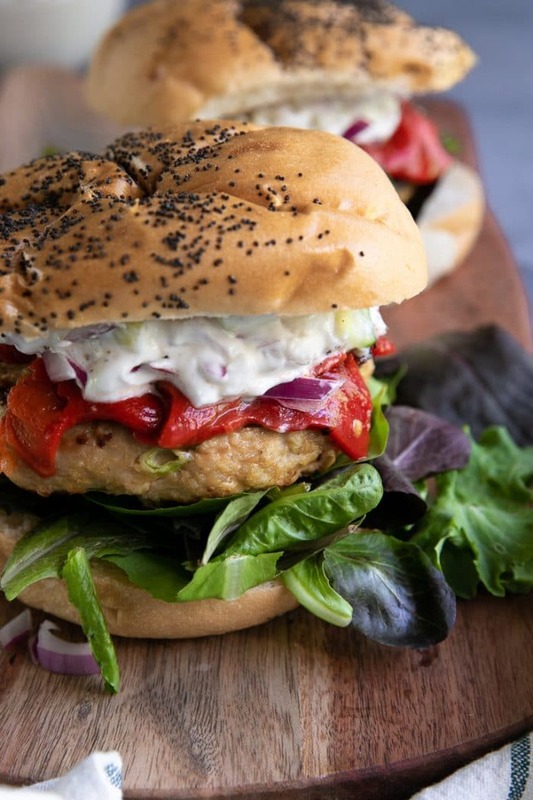 Would you go for this Mediterranean turkey burger or the beef and mayo version? I gotta tell you, I love them both. BUT, I feel a whole lot better after eating the grilled turkey burger. I used this indoor electric grill to make these turkey burgers. I love it! Read more about this product in this post. In a large bowl, combine the ground turkey with the green onion, breadcrumbs, milk, egg, chili flakes, salt, pepper, and crumbled feta cheese. Thoroughly, mix to combine and use your hands to shape into 6 patties. Pre-heat grill to medium heat or indoor electric grill to high heat and grill for approximately 5-6 minutes on each side, or until internal temperature registers 165 degrees F.
As the turkey burgers cook, prepare the toppings. 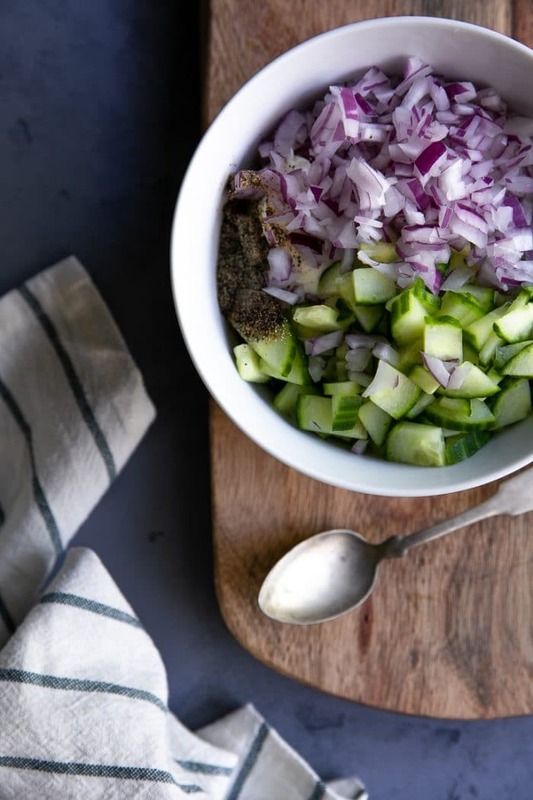 For the yogurt sauce, combine the Greek yogurt with the cucumber, red onion, dill, and salt and pepper, to taste. Just before serving, lightly toast your hamburger buns and assemble. Start with the lettuce on the bottom, followed by the turkey burger, roasted bell pepper, tomato, and cucumber yogurt sauce. Enjoy! Nutrition information does not include optional items. Want to try this Ground Turkey Recipe? to your Burger or Dinner Ideas Boards on Pinterest and save it for later!